I read an article a few weeks ago that I have been mulling over in my mind. I had a lengthy conversation/debate with my husband, I looked up a few related articles, and I did a little research. Charles London wrote an article for the Huffington Post at the end of August entitled "There Are No Boy Books." You can find the article here. He writes that he is considered a writer for boys because his books, while they include one female protagonist, also have a male protagonist, guns, fart jokes and giant squid. 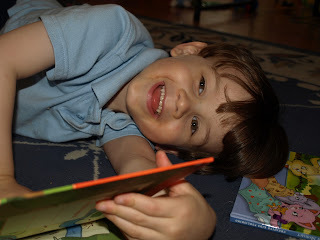 He goes on to say that "I'm troubled by this idea of 'boy books,' because it reinforces -- and perhaps recreates -- assumptions about boys and girls and the things they should like, while giving short shrift to the real issue at the heart of literacy building: reader experience." Mr. London concludes by saying that the essence of a good book should be a good story and that we do a disservice to our children by categorizing literature as "girl books" or "boy books." A similar article (at least in subject matter, if not in tone) was written by Robert Lipsyte in the New York Times only a week earlier.Mr. Lipsyte argues that, because teaching, publishing and writing are now enterprises run by women, there is nothing being produced that is appealing to young male readers. He appears to make the argument that while there were both men and women authors in the past whose books appealed to both genders, there are no books being written now (with the exception of his and a few others) that boys will want to read. I then found a blog post in response to Mr. Lipsyte's article which I found to be on-target. Saundra Mitchell, a YA Author, writes "The problem that needs to be fixed is not kick all the girls out of YA, it’s teach boys that stories featuring female protagonists or written by female authors also apply to them.Boys fall in love. Boys want to be important. Boys have hopes and fears and dreams and ambitions. What boys also have is a sexist society in which they are belittled for “liking girl stuff.” Male is neutral, female is specific." I am under no illusions that this is an issue with a simple solution, or even a simple argument. However, as a mother of a little boy and someone who reads perhaps more books than the average person on the street, I find this to ring true.When I signed my son up for a giveaway featuring the popular Ladybug Girl books, he was the only boy on the list. I started to think about the books that I had read in high school. Many of them were written by males about boys/men - The Lord of the Flies, A Catcher in the Rye, The Great Gatsby. The gender of their authors and characters had no affect on my appreciation for them (except for Catcher....I really hate The Catcher in the Rye. However, this has nothing to do with gender and everything to do with whining). My sister, who is a sophomore in high school was required to read Huckleberry Finn and The Curious Incident of The Dog in the Night-Time over the summer. Both of those books have male authors and male protagonists. There seems to be, in fact, a strong presence of male authors and characters at least within the walls of schools. I find most women open to reading books by male or female authors that feature male and female characters. However, when I speak with men who read, I find that many of them prefer books written by men about men. This led to the aforementioned discussion with my darling hubby, who argued that a man writes best about men, and women about women because they are writing from a place of knowledge. I disagree - I think a great story by a great author will always be great, regardless of gender. My conclusion is this: As a parent, I have the privilege to shape my son. I get to pick what he reads, at least until he goes to kindergarten. So I pay attention. We read a lot of books about trucks and trains, dinosaurs and pirates. But we also read Junie B. Jones and Madeline, Ladybug Girl and Amelia Bedelia. His favorite Disney characters right now are Peter Pan and Ariel, the Little Mermaid. I can develop a reader who will pick up a book not because of the gender of the writer or the gender of the main character, but because of an amazing story that will transport his mind and impact his heart. So what do you think, my lovely readers? Whether you are a parent, a teacher, a librarian, a college student, a 12 year old girl,or an 85 year old man, I want to know what you think. Comment away! And because I can't leave you on Wednesday without it, happy reading from this cute little guy!